InfoQ: Archaeopteryx: A Ruby MIDI Generator. Giles Bowkett captures the heart and soul of the RubyFringe conference as he demonstrates his revolutionary Archaeopteryx MIDI generator. He delivers an eloquent, highly politicized call to action in a career-defining presentation that is raucously hilarious yet unnerving in its practicality. – It’s about PROBABILITY and Standard-Beat.Matrix(es). I really like this guy – He also delivers sort of philosophy of his own and demoes the PROBAILITY MATRIX Stuff. When do we have that stuff in our tribes? Archaeopteryx: Ruby Self-Generating Pattern Sequencer from giles goat boy on Vimeo. did something like this with Kyma, but different..
Zurück Do you know this EEH Module? 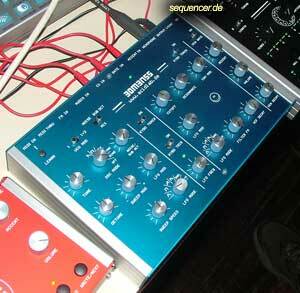 / Cm4 Sequencer? Weiter NI Hardware Groovebox? „Maschine“ – some MPC like thing or thang? Vxxy – Dcm8: Drumcomputer- Chiptunes!